Take your tech knowledge to a new level with this lifetime subscription deal. Getting the itch to learn some new skills, either for fun or to advance your career? 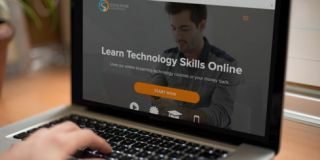 With access to Stone River eLearning, you'll be able to work through a massive library of online courses and learn any new tech-related skill that you can imagine. Get a lifetime subscription for just $85 (approx. £64). Stone River eLearning's library is packed with the skills you've been dying to learn. With over 140 courses and 2,000 hours of educational videos, you can get a lifetime’s worth of knowledge from this great base for tech learning – and new courses are added all the time so you'll never run out of topics. Pick any course and you'll be given professional instruction that you can apply to your job or use to pursue in your own time, from coding and design to 3D animation and more. Plus, you'll get to test your skills with certification exams. You can get lifetime access to Stone River eLearning's online courses for just $85 (approx. £64). That’s a massive saving of 99% off the retail price. Learn anything you’d like and do it at your own pace by grabbing this deal today.